I was recently contact by a Turkish journalist, Abdullah Bozkurt, of Turkey's largest Engligh-language daily, Today's Zaman, about the possibility of Israel using Turkish airspace to attack targets in Iran. Here is the article based in part on that interview. I have highlighted portions that include my comments. Although the US and Turkish opposition deem the strike an almost certain impossibility, even the remote chance of such an adventure is enough to raise concerns in Ankara as well as in numerous capitals in the Middle East. “Such an action would pit one Muslim state [Turkey] against another [Iran],” says Yılmaz Ateş, a deputy from Ankara and the deputy chairman of the Republican People’s Party (CHP), the main opposition party. Ateş told Today’s Zaman that an Israeli air strike violating Turkish airspace would have disastrous consequences. “I do not envision Israeli aircraft in Turkish airspace without permission,” stressed Lt. Col. Rick Francona, who is a retired US Air Force intelligence officer that had worked for the National Security Agency (NSA) and the CIA. Speaking to Today’s Zaman, military analyst Francona said, “I don’t think the Turks will allow it, especially since the December 2008-January 2009 Israeli attacks in Gaza.” “That operation has put a real strain on Turkey’s relations with Israel,” he noted. Israel has three routes to consider if -- a big “if” many argue -- it is willing to undertake an aerial attack on Iranian nuclear sites. The northern route entails flying from Israel to the north toward the corner of the Syrian-Turkish border, then turning east and hugging the Syrian border. The central route goes over Jordan and Iraq, while the southern route takes an attack squadron through Saudi Arabia and then to Iran via Iraq or even Kuwait. 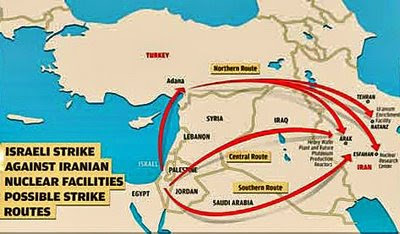 A report released by the Center for Strategic and International Studies (CSIS), a Washington-based think tank, in March 2009 suggests that a military strike by Israel against Iranian nuclear facilities is possible and that the optimum route would be the northern one along the Syrian-Turkish border, then over a small portion of Iraq into Iran, and back along the same route. The CSIS report argues that all of the other options are deemed too risky. Even for the northern route using Turkish airspace, the report underlines that the number of aircraft required, the logistics of refueling along the way and the ability to get to the targets without being detected or intercepted would be complex and very risky, and would lack any assurances that the overall mission would have a high success rate. The most significant challenge in terms of logistics comes from the aerial refueling, as the fuel capacity of Israeli aircraft does not allow a flight to reach a target in Iran on a single tank. According to a report last year by an Austin-based private strategic forecasting company, Stratfor, Israel already possesses significant aerial refueling capabilities. “Nevertheless, the Israeli Air Force would probably be extremely stretched in terms of these assets to attempt a bombing campaign against Iran,” the agency noted. Francona underlined that “if Israel uses Turkish airspace, the Israeli fighter-bombers will have to be refueled, either in the air or on the ground.” “Either option will require Turkish permission at the least [for aerial refueling] or Turkish cooperation [for ground refueling],” he emphasized. That seems very unlikely as Turkey would never agree to cooperate in an operation that would lead to hostile action against Iran. Turkey was furious at Israel in 2007 when Israeli warplanes attacked a target at Deir ez-Zor in northeast Syria, and exited Syrian airspace by traveling towards the Mediterranean via Turkey. After discovering that two Israeli fuel tanks had been dropped by the warplanes in Turkish territory, one near Gaziantep and the other near Antakya, Ankara demanded an explanation from Israel. Turkish deputy Ateş remembers that he submitted a parliamentary inquiry motion in 2007, asking Minister of Defense Vecdi Gönül to respond to allegations of airspace violation. The copy of the documents obtained by Today’s Zaman shows the Ministry of Defense dodged questions that were raised by Ateş. Gönül simply referred the case to Foreign Ministry and said “the investigation into the allegations is still going on.” “I was very frustrated to see that the government declined to respond to any question, casting a shadow over what really happened on that day,” Ateş said. Turkish officials told Today’s Zaman that Ankara delivered a very strong protest note to Tel Aviv; then-Prime Minister of Israel Ehud Olmert publicly apologized for the incident in late October 2007 and stressed that they had never intended to violate the sovereignty of Turkey. When the question was asked on the issue, President Abdullah Gül said, “I consider the case closed.” The speculation was, however, that IAF fighter jets came under fire from Syrian air defenses and war planes jettisoned the fuel tanks to increase speed and maneuverability. In a more conspiratorial interpretation, one source told Today’s Zaman that Israel instigated the incident to pit Turkey against Syria and the planes had deliberately dropped the fuel tanks on Turkish territory to give the impression that Ankara gave a go ahead to the Israeli strike on Syrian targets. “Fortunately both Syrian and Turkish officials shared their intelligence and discovered the ploy and relations were not damaged,” the source noted. Still, many believe the operation is a very risky one as Israel could be required to hit more than a dozen targets, including sites like Natanz, where thousands of centrifuges produce enriched uranium; Esfahan, where 250 metric tons of gas are stored in tunnels; and Arak, where a heavy water reactor produces plutonium. According to CSIS estimates, the IAF needs at least 90 strike fighters and refueling airplanes to accomplish that. Francona warns Israelis that Turkey’s air surveillance capabilities are far more effective than anyone Israel has ever flown against. “To attempt to reach targets in Iran via Turkey without Turkish permission is virtually impossible, and I do not think the Israelis will attempt to do so,” he said. Al-Qa'idah in Iraq - "We're still here..."
Iran - Can cutting off gasoline imports work? Weapons in a mosque in Qalqiliyah - surprise?